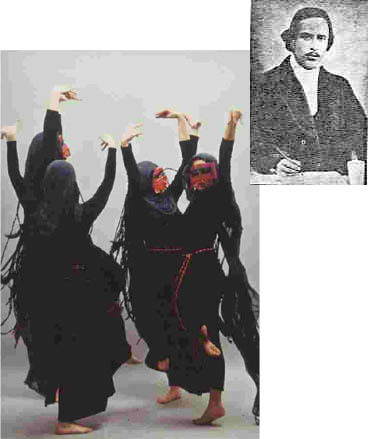 Kafaneh Siah aka The Black Veil is a major classic yet quite unknown play by Persian Poet/Writer Mirzadeh Eshghi (born as Sayed Mohammad Reza Eshghi) (1893 - July 3, 1924).Born in Hamadan, the Francophile writer learned French at the Ecole d'Alliance, and later moved to Istanbul for a while. He is particularly famous for writing the Opera Rastakhiz Iran (The Resurrected Iran), which was a reflection of his patriotic spirit. After returning to <?xml:namespace prefix = st1 ns = "urn:schemas-microsoft-com:office:smarttags" />Iran, he published some newspapers in which he fiercely attacked the rigid political system of Iran. He is remembered for writing 6 plays. 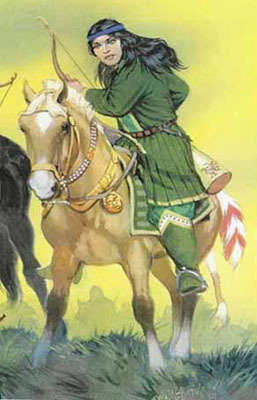 His "Noruz nameh" is particularly famous. 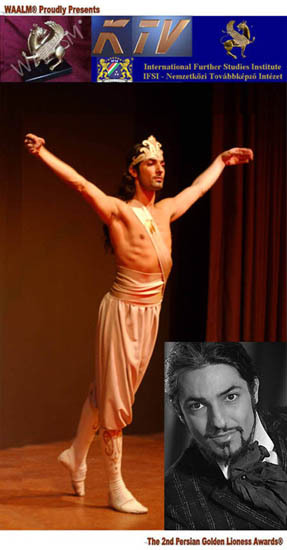 With the 100th anniversary of the Constitutional Revolution of 1906 that was the first democratic popular uprising of the 20th Century and inspired other democratic upheavals in the years to come such as the Russian Revolution in the neighbouring Tzarist Empire, multi talented Dancer/actor Shahrokh Moshkin Ghalam (**) known for his breathtaking Ballet/Sufi Dance performances ( and should it be noted unique Foreign Pensionnaire of the prestigious French Com�die Fran�aise since its inception by Jean-Baptiste Poquelin better known as Moliere ) revisits a classic repertoire of the legendary doomed Persian Writer who was shot dead at the age of 31, by some unknown gangs, the culprits of whom were never quite identified. Eshghi's portrayal by Moshkin Ghalam reveals a Man caught in doubts and anguish and at times haunted by dreams of seeing the Persian Woman caught in the social and religious prison that is symbolized by her Veil. 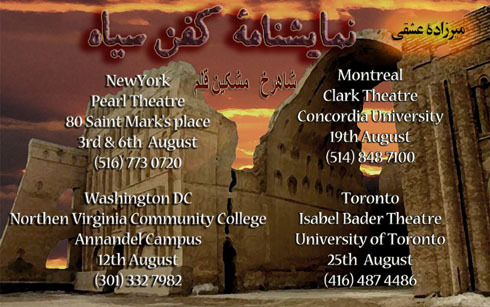 Through a sober yet poignant stage direction we are to follow the writer's journey through Persia to Turkey that appears as an introspection as well as self imposed exile through the ages of Persian Glory and gradual but fatally inevitable decline under the successive invasions by Mongul and Muslim Tribes. Eshghi uses the symbolism of the Black Veil imposed on the Persian Woman to illustrate this decline through the presence of masked and Burqa that resonate strongly in the context of today's post 9/11th World and so sadly imposed by Talibans in Afghanistan. Directed and performed by Shahrokh Moshkin Ghalam in an critically acclaimed performance at the Parisian Salle Adyar with the participation of a talented Crew of confirmed Theater actors such as Hamid Javdan ( Les Hommes et La chose play by Ebrahim Makki) and Behi Djannati Atai (who also has co-starred with such greats as Nick Nolte in James Ivory's Jefferson in Paris or Richard Dreyfuss in The Old Man who read Loves stories ). Shahrokh Moshkin Ghalam (SMG) : "The play Kafaneh Siah as its title suggest was written by Mirzadeh Eshghi with all his conviction and poetic and physical strength, at a time when Women were forced to wear the Veil. For Eshghi ever since being imposed the traditional Chador, Persian Women have been living in a kind of Kafaneh Siah or Black Veil of suppression and humiliation. So in fact She is no more alive but rather a living dead. For me this work is incredibly contemporary and bold and I was surprised to rediscover this text. I was also deeply amazed and touched to see that in our own literary history we have has such Brave Men and intellectuals but also that we can still discover some literary gems that have long been forgotten and on which we need to shed light and draw the attention of our own contemporaries. It would certainly avoid us to repeat some mistakes in our own social and collective lives. I was surprised to learn that few knew of the existence of this play and even upon suggesting it to many I was often surprised by their reaction. Had our intellectuals read this work or had heard of it most probably they would have reconsidered their political activism in favoring a regressive revolution nearly 75 years after a modern and progressive Constitutional Revolution in our country. Radio Farda (RF) : To what degree was your interpretation and stage direction influenced by what was actually indicated by its author ? 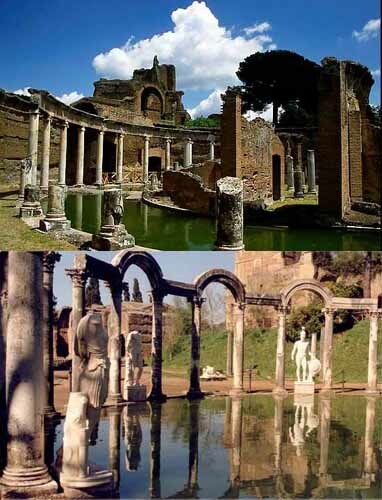 SMG : Obviously like any artist I let some of my own interpretation and visions illustrate my performance and even guide me, but many of the images are from archeological or historical sites like Bam or Persepolis that were actually inspired to me by an Italian villa Adriana which reminds me of the ruins of Eyvan� Mada�n. These ancient architectures I saw in Italy also had this magnificence reminiscent of our own Ancient Persian Glory and reflected my characters inner exile to which I could relate also. So basically as you noticed my character is that of Mirzadeh Eshghi himself who during his travels through the Middle East through places in Iraq and Turkey actually remembers these major Citadels and Palaces testifying as relics of the past glory of the Persian Empire. Behi Djannati Atai (BDA) : Well its actually the very first time I play in Persian Language which was an interesting challenge. My emotions genuinly surfaced from inside without inhibition and I should say I share my characters feelings in that I feel that our freedom as women was taken away from us as much during the time the play was written as much as today in our motherland by imposing us this Kafan . I play a Persian Sassanian (***) Princess who is revolted by seeing her female compatriots have to wear the Islamic Hijab under the threat of the Sword of intolerance. She expresses that Half of the Nation is dead and in saying so become the quintessential symbol of the Freedom fighting Iranian Women. Hamid Javdan (HJ): I was particularly proud to be the spokesman for our ancestors and that of Mirzadeh Eshghi, that explains why my voice was recorded to enhance the dramatic effect. RF: What was the difference between your words and those of Eshgi ? It should be noted that Shahrokh Moshkin Ghalam recently appeared on French National TV FR3 in the role of Selim Bassa for the 200th Anniversary of Mozart's "L'enlevement au S�rail" aka Entf�hrung aus dem Serail that was particularly saluted by the French viewers. He is also to be awarded at the upcoming Persian Golden Lioness Awards with an Award of Excellence in Dramatic Arts. 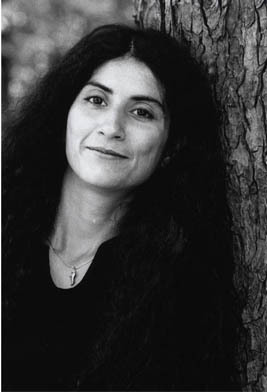 The 2nd Annual Persian Golden Lioness Awards� will be held in Budapest in October of 2006. 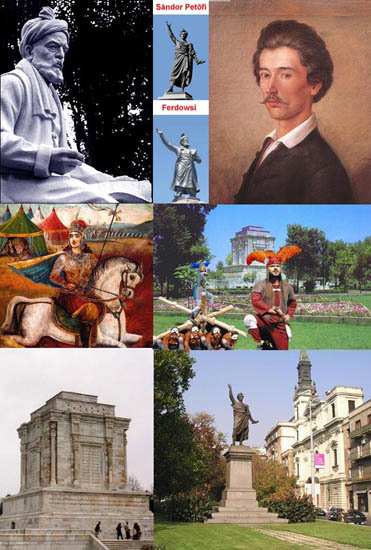 Hungary and its beautiful, cultural and historical capital Budapest is not only the host city for the Awards but also one of the Award winning nations being honored and participating in all categories of our academy. WAALM � will give full accommodation to the Awardees for their three-day stay visit that will include a tour of the city's highlights and will culminate by the Awards Ceremony. The latter will be covered by our academy's Media Partner KTV� a major broadcasting Hungarian company that will showcase the event to more than 300 000 Viewers. (*) The World Academy of Arts, Literature, and Media- WAALM� is an extension and awarding body of the International Further Studies Institute-IFSI� www.ifsi.hu . About the Author: Darius KADIVAR is a Freelance Journalist, Columnist of the OCPC Magazine. He operates as Paris based PR & Press for WAALM� 2nd annual Awards 2006.